Dr Rebecca E. Olson is a Senior Lecturer in Sociology in the School of Social Science at the University of Queensland. Dr Olson's research focuses on the sociology of health and illness, cancer and end-of-life care, interprofessional education and practice in healthcare, and the sociology of emotion and affect. From 2013-2016 she was an Associate Editor of the Journal of Sociology and Co-Convenor of the Australian Sociological Association's Sociology of Emotions and Affect thematic group. She has published widely in the areas of healthcare, interprofessional education, cancer and informal care, and has a particular interest in advancing innovative, video-based methods to study emotions in social life. 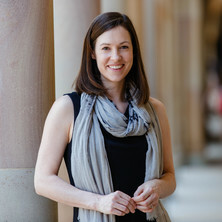 Her sole-authored book, “Towards a Sociology of Cancer Caregiving: Time to Feel” (Ashgate 2015), was supported by a collaborative grant from Cancer Australia and Cancer Council ACT. Her most recent book, "Emotions in Late Modernity" (Routledge, 2019, edited by Patulny, Bellocchi, Olson, Khorana, McKenzie & Peterie) explores the thesis that the social experience of emotions are changing in a contemporary landscape characterised by rapid change and digitally mediated communication. In my research, I examine carers of cancer patients' lived experiences, support needs and reflections on care coordination. Drawing on longitudinal qualitative data, this research offers fresh interactionist theorisation of cancer and end-of-life caregiving. In my research, I apply and extend Hochschild's concept of 'emotion work,' using Collins' 'emotional energy,' Bourdieu's 'reflexivity' and Massumi's 'affect.' I have a particular interest in advancing methodology within the sociology of emotions to more fully appreciate the layered, technical and everyday significance of emotions in social life. As a researcher of interprofessional education and practice, I apply a range of sociological theories to highlight the significance of context, hidden curricula and (inter)disciplinary knowledge to professional socialisation. My key contributions have been sociological approaches to conceptualising cancer care, interprofessional practice, and emotions. My work in advancing a sociology of cancer caregiving has resulted in fresh theorisation of caregiving in cancer care settings and practical insight into carers’ support preferences. Concepts such as ‘temporal anomie’ and ‘indefinite loss’ offer schemas for understanding variations in carers’ experiences, grief and subsequent support needs. Findings from my research into cancer care have informed the revision of online support offered to carers through the cancer council ACT website. My research into interprofessional education (IPE) advances theorisation of IPE and interprofessional practice (IPP) as two ends of a process of organisational change. Applying the sociologies of knowledge and identity to this subject has allowed me to highlight the significance of context, hidden curricula and (inter)disciplinary knowledge to professional socialisation. Findings from this research have been used to inform curriculum. My publication with co-author physiotherapist Prof. Andrea Bialowcerkowski (2014) in Medical Education earned the Silver Quill Award for the most downloaded article in 2014. Key findings from this paper have been taken up by the US National Academy of Science’s 2015 policy document on measuring the impact of interprofessional education. In my research, I employ a range of theories from the sociology of emotions and have an interest in advancing methodology within this subdiscipline. In 2014, I revised a method with co-author Dadich – affective critical appreciative inquiry (ACAI) – to foster embodied insights into text-based analysis (Dadich and Olson 2014). In 2015, I co-edited 2 special issues in Emotion Review on methodological innovations in the sociology of emotions, featuring contributions from leading sociologists from the USA, Australia and Europe. Current work tests the possibilities afforded through video-based research to transcend paradigmatic divisions that currently plague the sociology of emotions. More broadly, my contributions to sociology have been realised through roles as: Associate Editor of the Journal of Sociology (2013-2016); a member of The Australian Sociological Association, the International Society for Research on Emotions and the Australian and New Zealand Association for Health Professional Educators; a reviewer for numerous journals in sociology, health and interprofessional education; and as a member of the international advisory board for the peak sociology of emotions journal Emotions & Society. Olson, Rebecca E. Towards a sociology of cancer caregiving: time to feel. Surrey, United Kingdom: Ashgate, 2015. Emotions in late modernity. Edited by Roger Patulny, Alberto Bellocchi, Rebecca E. Olson, Sukhmani Khorana, Jordan McKenzie and Michelle Peterie Abingdon, Oxon, United Kingdom: Routledge, 2019. Patulny, Roger, Olson, Rebecca E., Khorana, Sukhmani, McKenzie, Jordan, Bellocchi, Alberto and Peterie, Michelle (2019). Conclusion: emotions in late modernity. In Roger Patulny, Alberto Bellocchi, Rebecca E. Olson, Sukhmani Khorana, Jordan McKenzie and Michelle Peterie (Ed. ), Emotions in late modernity (pp. 327-328) Abingdon, Oxon & New York: Routledge. Patulny, Roger and Olson, Rebecca E. (2019). Emotions in late modernity. In Roger Patulny, Alberto Bellocchi, Rebecca E. Olson, Sukhmani Khorana, Jordan McKenzie and Michelle Peterie (Ed. ), Emotions in late modernity (pp. 8-24) Abingdon, Oxon, United Kingdom: Routledge. Patulny, Roger, Olson, Rebecca E., Khorana, Sukhmani, McKenzie, Jordan, Bellocchi, Alberto and Peterie, Michelle (2019). Introduction. In Roger Patulny, Alberto Bellocchi, Rebecca E. Olson, Sukhmani Khorana, Jordan McKenzie and Michelle Peterie (Ed. ), Emotions in late modernity (pp. 1-7) Abingdon, Oxon, United Kingdom: Routledge. Olson, Rebecca E. and Dadich, Ann (2019). Power, (com)passion and trust in interprofessional healthcare. In Roger Patulny, Alberto Bellocchi, Rebecca E. Olson, Sukhmani Khorana, Jordan McKenzie and Michelle Peterie (Ed. ), Emotions in late modernity (pp. 267-281) Abingdon, Oxon, United Kingdom: Routledge. Olson, Rebecca E. (2016). Public health: Historical and contemporary principles and practices. In Pranee Liamputtong (Ed. ), Public Health: Local and Global Perspectives (pp. 25-44) Port Melbourne, VIC, Australia: Cambridge University Press. Olson, Rebecca E. and Abeysinghe, Sudeepa (2014). None of the above: Uncertainty and diagnosis. In Annemarie Goldstein Jutel and Kevin Dew (Ed. ), Social Issues in Diagnosis: An Introduction for Students and Clinicians (pp. 47-60) Baltimore, MD United States: Johns Hopkins University Press. Is cancer care dependant on informal carers? Copley, Jodie, Hill, Anne, Olson, Rebecca, Bartle, Emma, Dunwoodie, Ruth, Zuber, Alice and Barnett, Tessa (2018). The VOTIS – developing a video observation tool for assessment of inter-professional skills. In: Proceedings of the Australian & New Zealand Association for Health Professional Educators 2018 Conference. Australian and New Zealand Association for Health Professional Education (ANZAHPE) Conference, Hobart, TAS, Tasmania, (). 1-4 July 2018. Olson, Rebecca E. (2018). Undisciplining: post-paradigmatic analysis of emotions in social life. In: The Australian Sociological Association Conference: Precarity, Rights and Resistance, Melbourne, Australia, (). 19-22 November 2018. Bartle, Emma, Hill, Anne, Olson, Rebecca, Copley, Jodie, Dunwoodie, Ruth, Zuber, Alice and Barnett, Tessa (2017). Building capacity for the development of interprofessional skills in undergraduate dental curricula. In: International Association for Dental Research (IADR) Australia and New Zealand Conference, Adelaide, SA, Australia, (). 25-27 September 2017. Raymond, Stephanie and Olson, Rebecca E. (2017). Reflexivity2: fostering research reflexivity in university students studying group work as a group. In: The Australian Sociological Association Conference: Belonging in a Mobile World, Perth, WA, Australia, (). 27-30 November 2017. Olson, Rebecca E. (2015). Interprofessional education: status, emotions and power. In: The Australian Sociological Association Conference: Neoliberalism and Contemporary Challenges for the Asia-Pacific, Cairns, QLD, Australia, (). 23-26 November 2015. Students’ perceptions of eMarking: Grademark vs. iAnnotate. Olson, Rebecca and Tannous, Caterina (2015). Students’ perceptions of eMarking: Grademark vs. iAnnotate.. In: Student Transitions Achievement Retention Success (STARS) Handbook & proceedings. Student Transitions Achievement Retention Success (STARS) conference, Melbourne, Australia, (162-162). 1-4 July, 2015. Olson, Rebecca E., Burton, Anthony, Byron, Paul and Turnbull, Margo (2014). Exploratory comparison of providing formative assessment feedback in three different modes: Hardcopy, desktop and tablet. In: 17th International First Year in Higher Education Conference, Darwin, NT Australia, (). 6-9 July 2014. Dadich, Ann and Olson, Rebecca E. (2014). Interprofessional practice in healthcare: A POSH approach. In: ACSPRI Social Science Methodology Conference ACSPRI Social Science Methodology Conference 2014, University of Sydney, Australia, (). 7-10 December 2014. Olson, Rebecca E. and Prosser, Brenton (2012). Human care work and emotion: A call to re-examine theory. In: The Australian Sociological Association (TASA) Conference, University of Queensland St Lucia Campus, (). 26-29 November 2012. Olson, Rebecca E. (2010). Relying on carers at home and in the hospital. In: S. Velayutham, N. Ebert and S. Watkins, TASA 2010 Conference Proceedings:Social Causes, Private Lives. The Australian Sociological Association (TASA) Conference, Macquarie University, NSW, (). December 2010. Is this injectable tanning drug safe to use? Raymond, Stephanie and Olson, Rebecca E. (2016, June 16). Is this injectable tanning drug safe to use?. The Conversation, .